Sniper Chris Kyle did not live long enough. I don’t say this in the context of his and Chad Littlefield’s senseless murder at the hands of a supposed brother-in-arms, but in the context of the American Sniper movie trailer that has Kyle saying, “I’m willing to meet my Creator, and answer for every shot that I took.” If this statement is accurate — and I have not read the book or watched the movie — Kyle died before he had time to think it over. 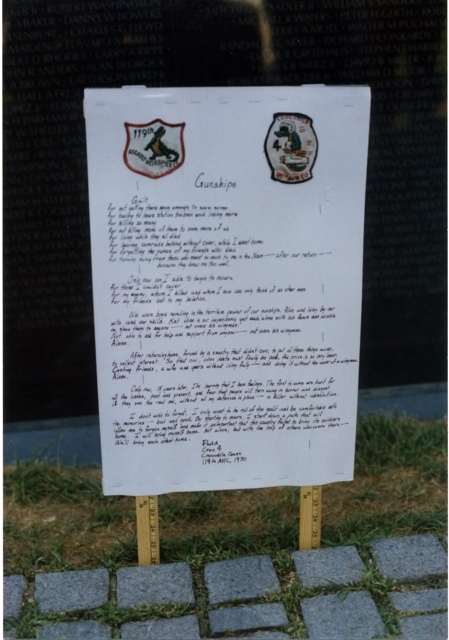 In 1985, I visited the Vietnam War Memorial in Washington, D.C. There I came across a poem written by a veteran named Pudd, a gunship pilot, call sign Croc 4, 119th Assault Helicopter Company, RVN 1970. In his poem, which I’ve included below, Pudd laments the costs of war and implicitly urges us to take better care when we send our youth to kill on our behalf. Memories such as these don’t fade over time. I should know: I was a gunship pilot in Vietnam the same year as Pudd. The framers of our Constitution clearly intended the care of which I speak to come in the form of an Article I declaration of war — as I’ve said before, if our wars are not worth declaring, they are not worth fighting. Forget the emptiness of “authorizations for the use of military force (AUMF)” and the equally vacuous “thank you for your service” platitudes. The absurdity of the former is revealed in the current debate about authorizing war on ISIS six months after we started making it and the latter by the 99% coasting while the 1% licks its wounds and buries its dead. Was Pudd’s poem written for me? Yes, and for all of my brothers and sisters, then and now. It was written for Kyle and Chad, and for the 19-year-old grunt sorting the chunks of “collateral damage” from artillery or air strikes in Iraq or Afghanistan. It was written for drone pilots who see what they kill and who are reportedly having problems with it. It was written for veterans who, ever after, struggle to fit in a civilized world. And it was written for the nation’s neocon chickenhawks and breast-thumping warmongers, the Cheneys, the Hannitys, the Kristols, those who made it all possible. These American monsters have killed so many and lived, even as their victims continue to die. Even as veterans like Pudd continue to mourn. Walt Stewart rose from a private in the army of regulars, reservists, and draftees raised to fight in Vietnam, to a major general serving with the thousands of citizen-soldiers of the 28th Infantry Division, Pennsylvania Army National Guard. Now retired, Stewart is a strong advocate for a citizen-military and a saner world. We were boys revelling in the terrible power of our gunships. Alive and living by our wits and our skills. Knit close in our dependency yet each alone with his fears and unable to show them to anyone—not even his wingman. Not able to ask for help and support from anyone—not even his wingman. After returning home forced by a country that didn’t care, to put all these things away, to collect interest. So that now, when debts must finally be paid, the price is so very dear. Costing friends, a wife and years without living fully—and doing it without the cover of a wingman. Only now, 15 years later, I’m learning that I have feelings. The first to come are hurt for all the losses, past and present, and fear that people will turn away in horror and disgust if they see the real me, without all my defenses in place—a killer without absolution. I don’t wish to forget. I only want to be rid of the guilt and be comfortable with the memories—bad and good. By starting to mourn, I start down a path that will allow me to forgive myself and make it unimportant that this country failed to bring its soldiers home. I will bring myself home. Not alone, but with the help of others who were there—We’ll bring each other home. Walt. I am not sure whether the last paragraphs in your heartfelt piece are yours or ‘Pudds’. Either way though they represent the internal tragedy of those young men who have fought our wars of ‘choice’ since WW II., Criminalized in senseless expansionist wars since Korea that are now becoming more fully understood by many but not by our political leadership. I have felt proud of my small part in WW II but today I am beginning to wonder if that victory which cost us over half a million dead just set up the rationalization for that small group who have conspired through the years to make our corporations the rulers of the world. Did I waste my youth in that war which , at the time, was so necessary? I don’t want to go our feeling this way but it is there and it bothers me a lot.. I think the small corporatist group you allude to, btraven, is only the latest in a continuum perhaps preceding Homo Sapiens. The war your youthful self served your country in occurred in the manner it did due to actions by many nations which were not necessary, but come 1939 – 1945 I would not be able to argue a case for why — or how — it should not have happened. And the particular war did not in anyway license the subsequent behaviors by American rent seekers (and others of the same ilk worldwide) than any other preceding event. The human race simply has yet in sufficient numbers to recognize that greed is a net negative impulse which should be regulated to minimize harmful outcomes; greed is not a condition necessary for human accomplishment or either the advance or sustenance of humanity. and it has contributed greatly to place life on earth in an arguably unsustainable position barring swift and total abandonment of present energy production practices and implementation of sustainable biological and mineral resource managment practices. I agree with you Imrchrdi. WW II, like WWI was avoidable if nations had not followed greedy goals of vengeance and acquisition of markets, etc. I used the “corporate” term as a shortcut for the underlying ‘dark group’ that seems to always be pulling the strings of our national policy. There was a fundamental difference though between our entry into WW II and all of the subsequent faux wars since Korea that we have been involved in. In 1941 we were indeed attacked by a well armed nation state, Japan, and because of their treaty relations with Germany and Italy ( the Axis) it involved us in a broader conflict. German human rights policys made ISIS look like schoolboys. All of these subsequent military misadventures of our government have been “wars of choice” . Even the 9/11 attacks were not by well armed nation states but by a band of rogue fanatics financed by our close friend, Saudi Arabia. With friends like that who needs enemies? Our citizens suffer from the same disease pre war German citizens suffered from , only in a different form. We have no charismatic Hitler to follow but our citizens follow corporate owned television and other MSM with the same blind adoration of Fuhrer worship. These outlets for information instead give them infomercials of government and corporate propaganda. Traven. The thoughts are mine. American monsters?! What else can I call them? It didn’t sink in until I stood graveside at the many funerals I attended for my National Guard soldiers, and others, coming home from Iraq and Afghanistan. It was as if the men (boys, really) I sent home from Vietnam in 1970 arrived on my door stoop 35-yers later. And it was not the grandeur of Arlington, where tragedy is overwhelmed by ceremony, but the closeness of small church services and graveyards located in the towns and villages of heartland Pennsylvania. Nothing I saw or did in Vietnam prepared me for it. I know that I will go to my grave WITHOUT witnessing the following: a U.S. president stands before the world and apologizes for the genocidal carnage unleashed against the peoples of Southeast Asia 1964-1975 (counting here only the period of US military escalation and final scaling down of the war) and admits that the 58,000 U.S. war dead were sacrificed in a ginned-up effort to stop “falling dominoes.” Then announces that resources will be diverted from the Pentagon budget to help civilians in Viet Nam, Cambodia and Laos as well as surviving American veterans from that era deal with their lingering problems, the aftermath of that criminal war. A nice bonus would be an announcement that the surviving architects of that war will be prosecuted for war crimes, as well as their successors who drew our nation into these unnecessary conflicts in Iraq, Afghanistan, Libya…the list still grows. None of this can possibly come to pass as long as so many of my fellow citizens swallow the hokum that our nation is “exceptional” and “called upon to lead” (i.e. DOMINATE) the world. I recently finished reading “American Reckoning: The Vietnam War and Our National Identity” by Christian G. Appy (The Viking Press, 2015) and highly recommend it. Yes — that’s not going to happen, Greg. The closest is Robert McNamara’s admission that “we were wrong, terribly wrong” about Vietnam and the war. Years ago here in the Upper Peninsula of Michigan, men’s fast-pitch softball was a pretty big thing with a lot of players, leagues and tournaments. With a lot of practice throwing against walls by myself, I became good enough, not “great”, to pitch quite a few games over the seasons. One of the most memorable games was played in Marquette, Michigan, on the shores of Lake Superior where Northern Michigan University is located, the school Michigan State basketball coach Tom Izzo attended. Joined a team in the Marquette league, and the league game that night was against a team with Tom Izzo on the roster. Was in my prime and when taking the mound could throw the softball as hard as possible each pitch for the entire game, the game ended at score 1-0, young Mr. Izzo (this was a long time ago) getting the one hit his team got off me, reached second on either a bunt or fielder’s choice, stole third (or the other way around), and scored his team’s only, winning run on a sacrifice fly. The hit was a weak popup over the second baseman’s head, just inches away from his glove as he attempted to make the catch before it dropped into right field. The game had all the intensity any ballplayer could ask for, and, never seeing Tom Izzo again, always wondered if he remembered it. My guess is, if asked, he would remember the game because it was a great ballgame, even though nothing was on the line but a league win or loss. The point is that, during the two hours that ballgame lasted the essence of athletic competition was experienced by everyone who participated on the field or watched from the stands, namely 100% effort. The reason for sharing this story is to inspire the writers and visitors here at Contrary Perspective. Collectively, you are doing very important, extremely consequential, and greatly appreciated work. Tom Izzo and his players’ goal is to win the NCAA men’s basketball championship; the goal at Contrary Perspective, although clearly much more complex and difficult than winning the NCAA championship, is ending wars of aggression on this Earth forever. Here’s hoping those who watch the upcoming NCAA tournament find ultimate inspiration from the intense effort and enthusiasm on the courts, while both Coach Izzo and his Spartans, and the team at Contrary Perspective, achieve their respective, truly noble goals. Thank you Jerry. As a former Michigander in my thirties I loved the Upper Peninsula.It was a magic place. Rugged and wild. We outdoor camped there several times and when we moved to Chicago I raced in the annual Mackinac Race and would always pull into St. Ignace after the race to avoid the crowd in Mackinac Island. . It was like another world at that time. We value your comments and appreciate the thought you put into them.. Your comments and others add to the high level of the discourse the articles enjoy.